By the year 2030, one in five people living in the US will be age 65 or older. And while the population continues to age, a lot more space will be dedicated to taking care of seniors when they need it most. Facilities are opening up all the time, dedicating themselves to different levels of care. Some individuals are taking matters into their own hands, and redesigning their homes with aging in place in mind. 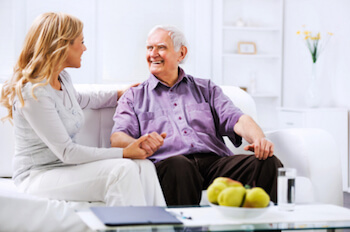 Yet no matter what level of care you provide, seniors have special needs that begin with the way a site is designed and the way it functions on a day to day basis. It’s a fine line between choosing a floor that will be safe, sanitary and easy to maintain, and one that looks good too. As we age, our balance continues to decrease, and the chances of falling goes up. To avoid injury, the harder a floor is, the more likely a fall will turn into an injury. Soft floors can cushion a fall, and give a person more protection as they land. Soft flooring choices include cork, carpeting, padded vinyl and rubber. In addition to softness, it’s also important to pay attention to traction, as tripping is one of the number one reasons behind a fall. In bathrooms, kitchens and other areas where water and liquid spills are a possibility, it’s important to create a surface that doesn’t become slippery when wet. Also focus in on transitions as a person moves from room to room. Shuffling feet can easily get caught up in even the smallest of adjustments in height, and give walkers a reason to fall. While safety is a number one priority for any facility created for seniors, maintenance should also be a top concern. When mobility is an issue, accidents are more prone to happen on a regular basis. To be able to clean and disinfect floors each time an accident occurs will create a healthier environment overall, and keep the facility looking its best with simple cleaning methods. Different types of flooring can also effect indoor air quality within the space itself. Some flooring choices, such as vinyl, can give off small amounts of Volatile Organic Chemicals, which can impact some residents with allergies or breathing problems. Some flooring choices, like carpeting, can allow dust and dirt to accumulate in the flooring, and ultimately end up in the air as movement occurs. It’s important to understand the purpose of each room, and make your final selection wisely depending on your needs. Have any additional questions about flooring for your senior facility? Give us a call today.